We’d love your help. Let us know what’s wrong with this preview of Glasses by Ann Gwinn Zawistoski. A board book about the role of glasses in a young child's life. The book features high quality photos of babies, toddlers, and preschoolers wearing glasses while playing, exploring, and just being a kid. The photos are accompanied by a simple rhyming text about glasses. I think your glasses look great on you!" To ask other readers questions about Glasses, please sign up. Is this book available in Australia? Love this book! Wish every one with kids could have a copy :-). A charming board book for young children about important their glasses are. This arrived too late for my son (who has other visual issues, and wouldn't benefit from glasses) but would have been great for the two-three year olds who may find themselves, or their friends, struggling with glasses for the first time. This is a great little book for kids who need glasses (or their friends & family). The pictures are adorable and show babies, kids, and even a grown-up in glasses. My 2.5 year old quickly picked up the rhyme and can "read" some of the lines back to me. Highly recommended! What a great book to show kids with and without glasses. My 2 year old was pointing to the kids in the book saying glasses, then pointing to hers and my glasses. 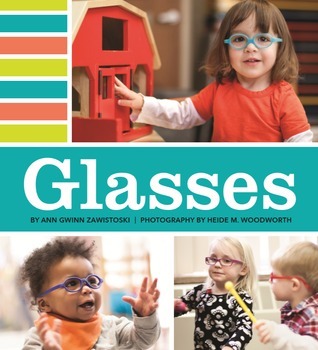 Thank you for putting this book together to showcase little ones with glasses. This is a darling book for any child, not just those with glasses! The pictures are charming, and the ethnic diversity of the kids depicted is especially appreciated. The text works well as a read-aloud, as well. Love it! I loved this book even more than I expected. The photographs are absolutely darling and the text works well with the pictures. Ordered this book for my 18 mo. old grand daughter, paid with Paypal August 17th still have no book, although email says it shipped. Several emails never answered. Not a happy customer. I bought this as a gift for a friend whose grandson wears glasses. She loves it! Couldn't wait to read it to him over the holidays. It's a beautiful little board book. "Look, Mommy, they all have glasses just like me!! My three year old daughter was thrilled with this sturdy board board with vivid photographs showing young kids with glasses. My 2 year old son is getting glasses and so purchased this book for that reason. It's adorable! My 3.5 year old just got his first set of glasses and he fell in love with this book at the optimists' office. I order it as soon as we got home. We love this book.